I have been wanting to visit the Intrepid aircraft carrier since the arrival of the NASA Space shuttle. As my parents were in town I thought it would be a perfect opportunity to be a tourist and check it out. Unfortunately it wasn't a great day weather wise, it was a bit cold and drizzling rain. As you have to queue outside to go through a rather pointless security check point (the security guard wasn't paying any attention) I would make sure you bring an umbrella if its raining. There are various ticket options available and we opted for the general admission plus entrance to the space shuttle pavilion, which was an extra $7 on top of the $22 GA fee. 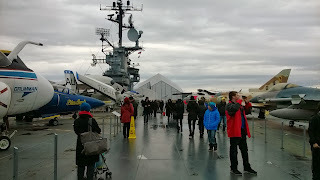 Once on board the aircraft carrier we headed straight for the space shuttle pavilion at the top of the Intrepid. 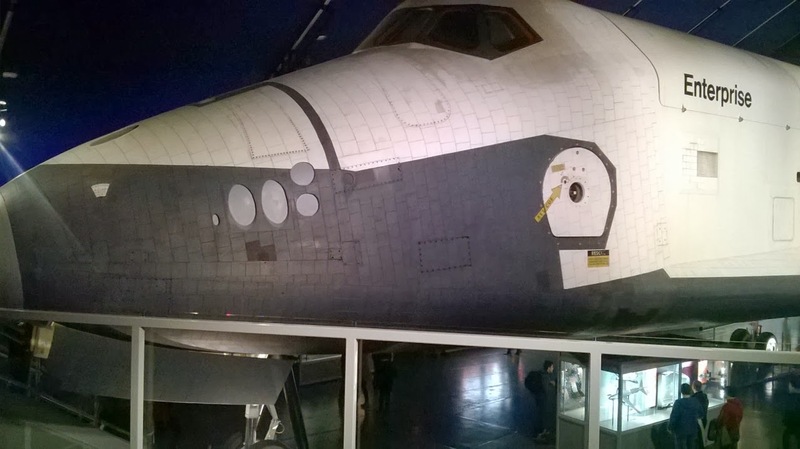 The Enterprise shuttle itself was very impressive, you were able to walk around and under it, and there was a viewing platform for a closer look. Unfortunately though, you couldn't actually see anything inside the aircraft. I was expecting to be able to peek into the cockpit, but you could only view the outside. There were a few interesting exhibits and a very cool Lego replica of the shuttle transportation to the Intrepid. It was great to see the shuttle, but I don't think you should have to pay extra, it should be included in the GA price. After viewing the shuttle we had a quick look at the other aircrafts on display, which my Dad was more impressed with than me! We then took the tour around the 'Navigation Bridge' which was the hub of the Intrepid when it was in service. It was very busy and the spaces are small, so it did feel a little claustrophobic at times, but was great to see where and how they navigated the ship. As we were a bit cold and damp from the weather we headed inside for a coffee. There is an 'Au Bon Pain' on the third deck, so we warmed up there and continued our self-guided tour. I always find the living quarters of these ships fascinating, so walking around these areas of the ship was my favourite part of the museum. I don't know how they slept in such tiny bunks, or how they served the thousands of meals required each day! The Hanger desk is home to the the indoor exhibits, various simulators and theaters. The 'Discovery Deck' is a great place to get hands-on as you can try out you skills as an astronaut, land a plane and sleep in one of those tiny bunks. We watched the 'Kamikaze Experience' which told the amazing story of how the Intrepid had been attacked during Pearl Harbor. It felt very surreal to be standing in the very spot that had been bombed all those years ago. 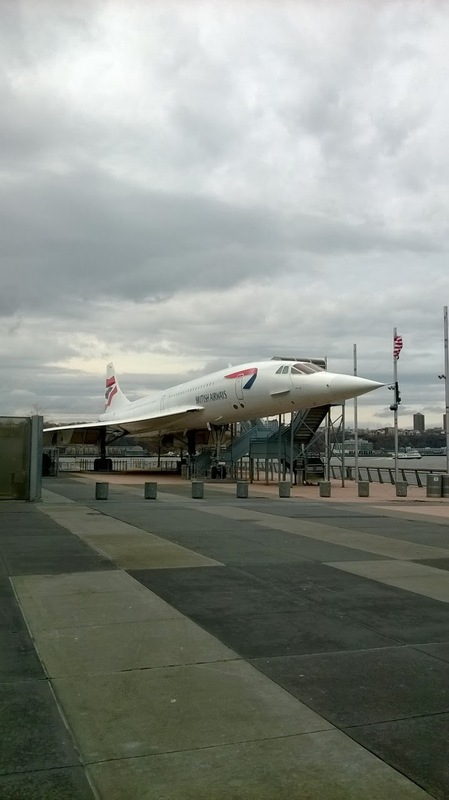 Finally, we went outside to get a view of the beautiful British Airways Concorde. It is still a futuristic looking plane and it made me wonder how long it would be until they develop something similar. It was a great way to end out time on the Intrepid. I very much enjoyed my visit, there are lots of things to see on board this unique museum, especially if you are an enthusiast, and it is a great place to take kids. 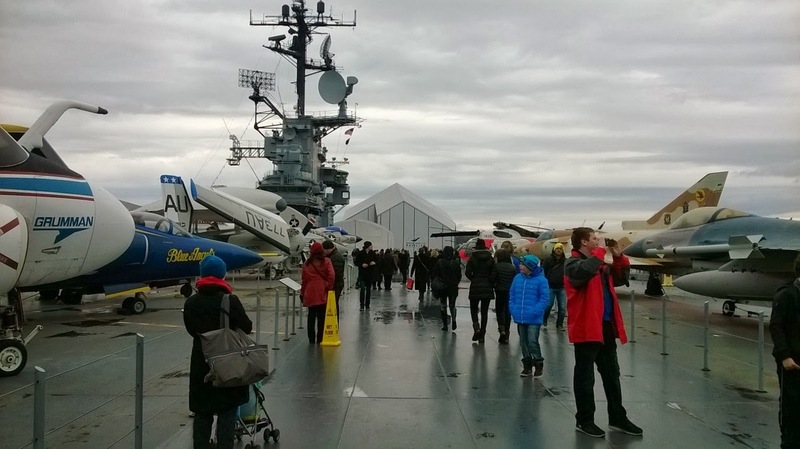 The Intrepid museum is located at Pier 86 W 46th Street at 12th Avenue and is open daily from 10am. Tickets start at $22, but it costs extra to visit certain exhibits and ride on the simulators. Tickets can be purchased in advance, which is worth doing as you avoid queuing up when you get there. For more information visit http://www.intrepidmuseum.org. Happy 2014 everyone! I hope you all had a fantastic Christmas and festive season. It was my first Christmas in the city for 2 years and I had a great time walking through Central Park in the cold and eating too much! My parents flew over from the UK for New Year, and as it was my first in the city, it made it extra special. We went for dinner and then watched the fireworks over Central Park, which were amazing. It was pretty chilly watching them outside, but luckily a glass or two of champagne helped us fight the cold weather. I made a few new year's resolutions, one of which is to make time to blog more often. I have neglected my writing a bit lately and want to get back into it in 2014, so look out for more posts coming soon!